Maintaining a garden is not a simple task. You have to make sure that your plants are regularly watered, are in a location where the climate is suitable for them, and ensure that they are properly nourished. Failing to do these will make the plants sick and weak which will attract pests. 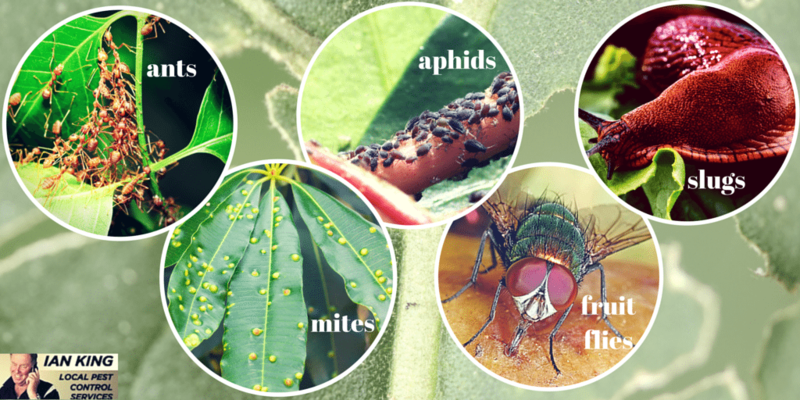 Below is a list of common pests that you should watch out for. Ants don’t directly cause damage. However, their presence is not wanted in a garden because they can attract aphids and other pests. They eat the honeydew excreted by the aforementioned pests. They also transport crawlers and eggs from one plant to another. They become problematic for trees and shrubs. To drive away ants, insect spray or use talcum powder. Mites are very small arachnids that eat the sap of the plants. They cause the plant to become dried and discoloured. The common variety of mites that causes gardeners headaches are the eriophyid type. Wet the undersides of the leaf of the plant with spray and sulphur dust during the morning. Avoid using the treatments frequently because mites can become resistant to it. Fruit flies have a strong affinity for veggies and fruits. Their birth cycle takes about 5 weeks. Their eggs are laid onto the fruit producing maggots as the fruit ripens. The maggots will develop into flies that cause menace during spring to summer. Control of these pests cannot be done without spraying. Don’t leave fallen fruits on the ground longer than 3 days. Aphids are also known as Greenflies. They are usually green, but are also present in other colours such as black, pink, and grey. They are very rampant in summer and spring. They come out in large groups to feed. They eat the sap out of the buds and fresh shoots which make the plant wither and cause flowers to become distorted. They can also go for the roots and leaves. They are easily managed by using jets of water or crushing the clusters with your hand. Every gardener will be able to recognise these molluscs. They usually come out at night to feed on a variety of plants, especially seedlings that have been recently planted. They are very active in spring and autumn. They can multiply quickly if preventive measures are not observed. Your garden must be spruced up to eliminate their breeding grounds such as pot rims, leaves that are near the ground, and underneath bricks. Sawdust, sand, or crushed stone can drive them away. Do you feel that the garden pests in your home are already beyond your control? A professional local pest control and extermination services provider can solve your problem. Contact us to request for a no-obligation quotation.